This article is about the Australian television programme. For the dog breed, see Australian Cattle Dog. Blue Heelers was first aired on 10 September 1993, with the episode "A Woman's Place". The last episode, aired on 4 June 2006, was the 510th episode, "One Day More". It was produced by Southern Star for the Seven Network. During its 13-season run it won a total of 32 awards and was nominated for a further 50. This included 25 Logie Awards, five of which were the Gold Logie, the most coveted television award in Australia. As well as everyday policing matters, the series deals with many controversial and "touchy" subjects. The series was the first to examine the stressful world of young police officers who are "thrown into the deep end where they are left to sink or swim". Police procedurals were enormously popular in Australia in the 1960s and 1970s, but by the 1980s they had been replaced by home-grown soap operas and mini-series. Blue Heelers, however, was Australia's most popular television drama while it lasted. The series drew more than 2.5 million viewers every week at its peak. Along with Homicide, Blue Heelers holds the Australian record for most episodes produced of a weekly prime-time drama. It was also nearly the longest-running series, but Homicide lasted one calendar month longer and, due to five feature-length episodes, had more time on air. Blue Heelers has also gained recognition in the UK, Ireland, New Zealand, Canada and other countries. It has been sold to 108 territories. Blue Heelers launched the careers of many Australian actors, such as Lisa McCune, Grant Bowler, Ditch Davey, Rachel Gordon, Tasma Walton, Charlie Clausen and Jane Allsop. While many of these actors are still best known for their work on Blue Heelers, some have gone on to bigger roles. Many other actors of today also appeared in guest roles, including Hugh Jackman, Charles 'Bud' Tingwell, Peter O'Brien and John Howard. John Wood and Julie Nihill remained with Blue Heelers during its entire 12-year run, portraying Senior Sergeant Tom Croydon and the publican Chris Riley respectively. The series primarily focuses on the daily lives of Victorian police officers working at a police station in the fictional small town of Mount Thomas. Each episode is presented from the perspective of the officers. This was a specific technique that creator Hal McElroy chose to employ. The police officers, commonly referred to as "Heelers", are always active sorting out the town's many problems. These problems range from trivial complaints such as land and fencing disputes to more serious offences, such as homicides and assaults. The small town is also faced with many other significant occurrences including bank robberies, escaped criminals, police shootings, kidnappings and the acts of deluded criminals. Of these, one of the more significant events is the bombing of the police station during the show's eleventh season. Whenever overwhelmed, the Heelers call on the assistance of the police in the larger town of St Davids, home of the resident police inspector Russell Falcon-Price. An antagonist in the series, Falcon-Price often tries to terminate the employment of the Mount Thomas sergeant or to close the entire station. Along with their police work, aspects of the Heelers' personal lives are regularly featured, notably the relationship between Maggie and PJ, which ends with Maggie's death in one of the most watched moments on Australian television. Each episode featured a range of guest cast members, and over the run of the series hundreds of actors featured in these roles. As well as the main (regular) cast members, a number of well-known Australian actors frequently appeared as either recurring or semi-regular characters. These included Terry Gill as Superintendent Clive Adamson, Neil Pigot as Inspector Russel Falcon-Price, Jeremy Kewley as Mt Thomas journalist Tony Timms, Frankie J. Holden as Snr. Det. Jack Woodley, Catherine Wilkin, Debra Lawrance, Emily Browning, Josh Lawson, along with Suzi Dougherty as Dr. Mel Carter, Peta Doodson as Inspector Monica Draper, Beth Buchanan as Susan Croydon, Michael Isaacs as Clancy Freeman, and the late Reg Evans as Keith Purvis. Many other notable actors also had one-off or recurring guest roles in Blue Heelers including Shane Bourne, Hugh Jackman, Gerard Kennedy, David Wenham, Marcus Graham, Peter O'Brien, Gary Sweet, Vince Colosimo, Alan Cinis and Alan Dale. On average, 42 episodes of Blue Heelers were broadcast per year on Australian television, with each episode comprising fifty scenes. One episode was made every week. The scripts were written to a formula which allowed one day for rehearsal, two days on location and two days in the studio. Episodes were shot eight to ten weeks ahead of their scheduled broadcast date. There were 16 episodes in various stages of production at any one time (from the conception of new storylines to post-production). In addition, there were always seven complete episodes waiting to go to air. Apart from the regular cast members, the show employed 4,300 guest actors annually, plus 30 extras every week. A total of 150 people were involved in some way with the show's production each week, including cast members, crew, wardrobe, publicists and writers. Blue Heelers creator/producer, Hal McElroy, conceived the idea of Blue Heelers when he heard that an eighteen-year-old friend was planning to become a police officer. Intrigued, he inquired as to why this young boy, fresh out of school, would want to become a police officer, as opposed to the many other opportunities he had open to him. McElroy soon discovered that, at the time, a staggering 60% of Australian police officers were under the age of 26. This, coupled with McElroy's desire to create a country cop show, formed the basis of the programme. When this same young officer left the force only a year later due to the shooting death of his colleague, McElroy was even more intrigued to learn about the very fickle, yet rewarding job of policing the community. McElroy continued his quest by asking ex-police officer Michael Winter to write down what it was like to be a city cop who transferred to a country town. These became the ideas that Blue Heelers was based around. Michael Winter also conceived the name of the programme by recounting the common names for a country police officer: "tyre-biters"—referring to the fact that country cops are often involved in car chases—and "blue heelers"—referring to their blue uniforms and overall similar appearance and persona to a Blue Heeler dog, a protective and intuitive breed of Australian dog. From the time that McElroy's idea was initially conceived, to the time the programme was ready to air, three years passed. During the early development of Blue Heelers two completely different pilots were shot: one depicting the story from the perspective of a police officer and the other from the perspective of a criminal. When these were presented to the Seven Network, the network committed to 13 episodes of the first pilot. The pilot went on to become the official first episode of Blue Heelers, telling the story of a new cop in town, Maggie Doyle, and her beginnings in Mount Thomas. Hal McElroy chose to discard the second pilot, realising it was a fatal mistake to be "with the criminals as they plotted the crime". He also conceived his rule that the producers of the show "couldn't have a camera in a room unless there was a copper there as well" (a rule shared by long-running UK Police drama The Bill). Hence, the basis of the show being from a police officer's perspective became a firm reality. (The only bending of this rule was with scenes featuring publican Chris; as she was billed with the main cast, she was given the same on-screen "rules" as the officers. In early episodes, before she worked at the station, this "rule" also applied to Wayne Patterson's wife Roz). He had been posted to Yass (in New South Wales) and he really loved it up there because the routine was so simple and straightforward-most often you knew the victim and sometimes you knew the culprit, and someone in charge would give them a clip behind the ear and say 'wash the police car' or 'sweep the yard' and 'don't ever do it again', rather than sending a juvenile to jail. I loved it, and I said 'Hey this is great'. But all the writers said, 'No it's boring, we want that gritty, inner-city police stuff'. (We had Boys in Blue set up in Leichhardt in Sydney.) And I still remember the moment I was driving home up River Road and I thought, 'Then we can have two shows'. I said to this copper 'What are you called in the country? What is your nickname?' And he said they call highway patrol 'tyre biters' and coppers 'blue heelers'. And I thought 'That's the title!' So I rang [scriptwriter] Tony Morphett and said 'Let's do a show about young cops in the country. It's called Blue Heelers. By creating the programme, McElroy and Morphett hoped to close the gap between to police and the public. They hoped to show the human side of the policing and that, like other citizens, police officers have feelings, regrets, aspirations and fears. They also hoped that the show would act as a tribute to the courage of police officers, who risk their lives everyday, never knowing if they'd return home at the end of the day. Only about half of the footage for each episode was shot on location. Most of the scenes, including scenes in the police station and pub, were filmed at the Seven Network studios in Melbourne. Much of the filming on location was carried out in towns such as Williamstown, and the more established parts of Werribee. The scenes of the outside of the Mount Thomas police station were actually filmed at the old, disused Williamstown police station, which was then a private residence. Scenes at Mount Thomas High School were filmed at Williamstown High School. The town of Castlemaine was most often used as the backdrop for Mount Thomas, seen in almost every episode. Although the Blue Heelers' pilot was shot in Castlemaine, the cast and crew very rarely returned there to shoot further episodes; images of Castlemaine were usually just establishing shots. Chris Riley's fictional Imperial Hotel, for example, was actually the real Imperial Hotel in Castlemaine. Mount Thomas' fictional Commercial Hotel was filmed at the Willy Tavern in Williamstown. The second Mount Thomas police station, adopted during the programme's reform of 2004, was filmed at Newport Railway workshops. The Mount Thomas Hospital was filmed at the Werribee Mercy Hospital. Described by critics before its launch as "A Country Practice meets Cop Shop", and as "the contemporary cousin of British cop show, Heartbeat", Blue Heelers was not anticipated by critics to become a hugely popular programme. However, it became a hit TV show soon after it began airing. During most of its broadcast, Blue Heelers was very popular in Australia, regularly attracting up to 2.5 million viewers, and up to 3.5 million viewers at its peak. Throughout the show's broadcast it continually drew a strong audience, regularly appearing among the top-rating prime time programmes on Australian television. Viewership of Blue Heelers never dropped below 1 million viewers. The episodes "Gold" and "Fool's Gold" (episodes 140 and 141), which aired during the programme's fourth season, were two of the most popular Blue Heelers episodes. Each drew 2.5 million viewers, considered a huge achievement in 1997. Blue Heelers' executive producer, Gus Howard believed the show's popularity was due mainly to the quality of the cast. Much of the success of Blue Heelers has been attributed to one of the best ensemble casts of any drama on television, with most every cast member becoming a household name... The basic vocation for the show has always been about shedding a little light on the human condition, something Australian audiences have readily identified with. The show epitomises and represents the Australian ethos in a way that truly reflects Australian life. Much of the show's sixth season, as well as the first 10 episodes of its seventh season, were the most watched episodes of the series. These episodes focus of the death of Maggie Doyle (played by Lisa McCune). Maggie's being shot and left for dead during episode 255, "One More Day", was ranked by TV Week as the third most memorable moment of a drama series on Australian television. After low ratings in 2003 and 2004, the producers and executives of Blue Heelers realised that there were apparent problems which could potentially lead to the series's downfall. In 2004 Blue Heelers lost the top ratings spot to McLeod's Daughters. During 2003 and 2004, Australian television drama was also at its "lowest point in a decade" and many popular shows were cancelled. As the show remained basically unchanged from its debut, ten years earlier, the production team decided that a revamp was in order. Mount Thomas was created in 1993 and the world has changed... It will now be more reflective of today's country towns, not the sleepy backwater it was. It wasn't an easy task but the creative team responded brilliantly and there's a real feeling of excitement again... The old girl can still dance. And dance to new tunes. The main plot, setting and character changes started in July 2004, with the airing of the episode "End of Innocence". In this episode, the main storyline was the bombing of the Mount Thomas police station. The blast killed popular main character Snr. Const. Jo Parrish (Jane Allsop) and recurring cast member Clancy Freeman, and injured the show's main protagonist, Senior Sergeant Croydon. After the bombing it was revealed that Croydon's wife, the Reverend Curtis, was missing. It was later revealed she had been brutally raped and murdered. These events brought about sweeping changes to the mood of not only Croydon, but also the mood of the entire show. The Daily Telegraph television writer Marcus Casey commented, "Mount Thomas has become a darker, grittier place, the people and cops in it transformed by an invasion of evil". Consequently, the story changed its focus from the old Mount Thomas police station to the new one that was used until the show's cancellation in 2006. The Seven Network feared that in the modern post-9/11 world, a show about country police was no longer what audiences wanted. Storylines of the proceeding five episodes focused on the bombing of the station and the 4 new main characters: Rachel Gordon as Amy Fox, Geoff Morrell as Mark Jacobs, Samantha Tolj as Kelly O'Rourke and Danny Raco as Joss Peroni. Popular former cast member William McInnes also returned to the show, temporarily reprising his role as Nick Schultz. Producers hoped the new tone of the series, the new younger actors, and McInnes's role reprisal would lure back viewers who had stopped watching the programme. This new style of programme that Blue Heelers was embracing was a sign of the show trying to keep up with other larger television shows, particularly the CSI franchise. The recent shake-up at the old station has swept aside an unhealthy staleness that had settled on the place and there's some much-needed fresh energy provided by the new recruits, including Samantha Tolj as true-blue Aussie gal Kelly O'Rourke and Danny Raco as Italian stallion Joss Peroni. In the hope that viewing would increase, an 11-episode season in 2006 was commissioned by the Seven Network. However, the ratings spike begun in 2004 was not sufficient for the Seven Network to commit to continuing to produce the show. In January 2006, Seven officially announced that they had cancelled Blue Heelers, but would air a final shortened season of 11 episodes in mid-2006. At the time the show was still drawing 1.2 million viewers per week on average, down from the 3.5 million it was drawing at its peak. The announcement was front-page news on nearly all of Australia's major newspapers including The Sydney Morning Herald, The Daily Telegraph (Sydney), The Melbourne Herald Sun, The Melbourne Age and Brisbane's Courier Mail. Two different endings were shot for the final episode, which finished filming on 20 December 2005. The first ending wrapped up all the show's storylines, while the second left the show open for another season; the second version was used. For Blue Heelers' final season in 2006, it was moved from its primetime Wednesday-night timeslot, to a lower rating Saturday-night timeslot. In the Saturday timeslot Blue Heelers competed with The Bill, a British police drama which had become quite popular in Australia on the Australian Broadcasting Corporation and Saturday Night AFL Coverage on Fox Footy Channel and Network Ten. This move was slammed by leading cast member, John Wood. Blue Heelers cancellation may also be related to Seven's AFL broadcast, which saw Seven invest $780m for the 5-year broadcasting rights of the game. Seasons generally ran in Australia from early February to late November. Each season generally consisted of 41 to 42 episodes. The eleventh season however, only consisted of 39 episodes, as the Seven Network had gained the rights to televise the 2004 Athens Olympic Games. In total, 510 episodes were aired: 509 hour-long standard episodes and one live episode. The live episode, titled "Reasonable Doubts", was filmed to celebrate Blue Heelers 10th year on the air. To prepare, the cast was given six days to memorise their lines. The final episode of the 13th season aired as a 2-hour tribute. It opened with an introduction from John Wood and concluded with a compilation of Blue Heelers moments from over its 13-season run. Australian television quiz-show, The Weakest Link, hosted by Cornelia Frances, also aired a Blue Heelers special episode on 9 August 2001. Cast members John Wood, Neil Pigot, Ditch Davey, Jeremy Kewley, Jane Allsop, Suzi Dougherty, Paul Bishop, Caroline Craig and Peta Doodson took part in this special event. A CD Album titled "Music From Blue Heelers" was released in 1995. It included the Blue Heelers theme music, plus other songs related to the program, many of them Country songs. The first full Blue Heelers novel, Maggie's Story, was written by Roger Dunn and released in 1997 by Coronet Books. In August 1998, a second novel, Tom's Story, written by Cassandra Carter was released by Bolinda Publishing. All seasons were released to DVD. They are no longer in print and on July 2013 the production company, Endemol Australia has stated there are no plans at this stage to re-release. On 2 November 2015 Channel 7 said that there are still no plans to Re-Release Blue Heelers on DVD or Blu-ray. it was announced on 6 May 2017 that the complete series would be re-released on DVD through Via Vision. Several episodes were released on VHS video cassette format in the later 1990s, including "In The Gun" and "Fair Crack of the Whip". In terms of awards, Blue Heelers is regarded as one of the most successful programmes on Australian television. Blue Heelers has been the recipient of many awards, including 25 Logie Awards, five of which are the prestigious Gold Logie, 3 AFI Television Awards, 3 People's Choice Awards, and 1 AWGIE Awards. Blue Heelers was nominated for a further twelve Gold Logies. Blue Heelers has also won multiple Silver Logies, including numerous Most Popular Actor, Most Popular Actress and Most Popular Programme awards, as well as many Outstanding Awards. Many Blue Heelers cast members have also presented awards at the Logies. In the 2005 50 Years 50 Shows poll,Blue Heelers was voted 37th greatest show on Australian television and ranked within the top ten dramas. Blue Heelers had a strong following not only in Australia, but also worldwide; it has been sold to 108 territories and is shown in over 70 countries. Blue Heelers originally aired on Tuesday nights at 7:30 pm on the Seven Network, thus it was limited to a PG content level restriction. When the series was hailed as a success it began the transition from this timeslot to the 8:30 pm timeslot on the same day. After the move, writers could explore more diverse storylines, as the show was restricted to an M rating. The third and fourth season premiers aired on Monday nights during the 8:30 pm timeslot, but the show moved back to its original slot before the next episode. In its fifth season, Blue Heelers moved to the Wednesday night 8:30 pm timeslot, which it occupied for most of its run, until the end of its twelfth season. This move was made to make way for hospital drama All Saints. Starting in 2004, the Seven Network aired Blue Heelers weekdays at 2:00 pm. All episodes aired with the final episode airing in 2007. This made way for the broadcast of early episodes of All Saints. In February 2014, repeats of series 12 started airing and in May 2014, repeats of series 13 aired on 7TWO. Blue Heelers has also screened on Hallmark Channel in Australia in various timeslots. In New Zealand Blue Heelers screened on TV One in a popular timeslot. However, following the on-screen death of Maggie Doyle, ratings fell, and the show was moved to a 9:30 pm slot on Friday. Following that, the show moved to a late night Thursday slot where the rest of the episodes played out, with the show beginning anywhere between 11:30 pm and midnight. It aired its final episode on TV One on 20 March 2008. Irish broadcaster RTÉ originally began airing Blue Heelers on Friday afternoons at 4:30 pm. Episodes were only a few months behind the Australian broadcast. The series took a two-year break in 2000, before re-commencing in a five-day-a-week timeslot at 10:30 am in early 2002. The show quickly caught up with the Australian broadcast; resulting in the show being scaled back to the original one episode a week in 2004, and moved to a late night Thursday timeslot typically around 1:00 am. RTÉ commenced broadcasting the final season on 30 May 2008 in a late night Saturday timeslot. RTÉ screened the final episode on 30 November 2008. RTÉ began re-airing Blue Heelers weekly from episode one, commencing on 24 June 2009, usually around 4:00 am Sunday mornings. RTÉ screened all episodes in their original unedited state. The drama proved very popular in Ireland and rated very well. Blue Heelers aired briefly in the United States of America in the early 2000s on the short-lived cable channel Trio (carried primarily by DirecTV). 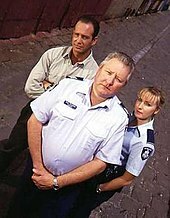 No episode after number 76 was ever shown in the United States, and when Trio changed their programming in 2004, Blue Heelers was dropped from the schedule. Blue Heelers was broadcast on Showcase in Canada, last airing on 15 May 1998. Blue Heelers is broadcasting on IRIB. All episodes were dubbed in Persian. In Italy Blue Heelers was broadcast on Italia 7 Gold (now called 7 Gold), from the 1st to the 6th season. All episodes were dubbed in Italian. In the United Kingdom the series was broadcast on most stations on the ITV Network. Many companies tended to screen the show as hour-long episodes in the afternoon (occasionally with necessary edits to suit the time slot, usually regarding profanity). Central Television started in February 1995 with a late night 23.40 slot on Mondays before following other regions with a typically 14.20 slot. Central were one of the most consistent ITV regions to broadcast Blue Heelers, completing series 6 by early 2002. Carlton Television aired Blue Heelers in half-hour episodes originally on Mondays to Wednesdays, starting from 3 January 1995, however the series then switched to airing hour-long episodes; Westcountry Television Also followed the half hour format, from early 1995 until September 2001. When the three Carlton owner station stated a uniformed schedule during 2002 Blue Heelers reverted to two-part half hour episodes; with the final batch of episodes shown in the regions were from Season 7 finishing on Wednesday 20 November 2002. Blue Heelers also aired on Anglia Television, Meridian Television and Channel Television, typically Mondays at 2:20 pm, during the summer school holidays it was broadcast daily in a morning slot, until late 1998. Granada and border also screened the series from 1995 in the hour long format but by 1998 dropped the series. Ulster Television (UTV) began airing Blue Heelers in early 1995. The show initially screened 3 times a week, on Monday, Wednesday and Friday afternoons at 1:50 pm. They then moved it to the 2:20 pm slot later in the series. A few episodes also ran at 11:40 pm on Thursday nights, as they were considered unsuitable for daytime viewing. UTV cancelled Blue Heelers in 1998. Scottish Television began aired hour-long episodes from 1995, airing on Fridays, and then later on Tuesdays from mid 1996, until episode 106, when the series was replaced by Murder She Wrote. The series then reappear on most Saturday afternoon during 1998 until December when the series was dropped. HTV, Yorkshire Television and Tyne Tees Television all chose not to import the show. When the English ITV contractors reformatted as one company in Late 2002, regionally-run programmes such as Blue Heelers (which were at different points of the series in each region) disappeared from screens. No ITV region ever screened the series in full. The show also aired on UK cable channel Carlton Select in the late 1990s, first screening the early episodes daily and then in a weekly slot Fridays at 20.00 as episodes became more recent. Episodes to the later part of the 1997 season were shown before the series was dropped. ^ a b c Zuk, Tim. Blue Heelers Awards, Australian Television Information Archive. ^ a b c Idato, Michael. "Final Farewell", Sydney Morning Herald, 29 May 2006. ^ a b Hallett,Bryce "Bush coppers show mettle", The Australian, 18 January 1994. ^ a b c "Blue Heelers Axed, and AFL the Main Suspect", Sydney Morning Herald, 14 January 2004. ^ a b c d Government of the Commonwealth of Australia. Small Screen, Big Picture, Big Future Archived 1 August 2008 at the Wayback Machine, Department of Communications, Information Technology and the Arts, July 2000. ^ a b c d James, Carol. Heelers hit 150, TV Week, 5 July 1997. Retrieved from LisaMcCune.net Archived 15 April 2018 at the Wayback Machine on 13 August 2008. ^ a b "Paranoia (Part 2)". Blue Heelers. Season 2. Episode 26. 1995-07-25. ^ a b "Random Breath". Blue Heelers. Season 4. Episode 17. 1997-06-03. ^ "A Fair Crack of the Whip (Part 1)". Blue Heelers. Season 4. Episode 14. 1996-04-30. ^ "The Lord Giveth". Blue Heelers. Season 8. Episode 32. 2001-10-03. ^ "Small Potatoes". Blue Heelers. Season 7. Episode 22. 2000-07-05. ^ "Burning Up". Blue Heelers. Season 13. Episode 7. 2007-05-13. ^ "Unfinished Business". Blue Heelers. Season 7. Episode 9. 2000-04-05. ^ "Just Deserts". Blue Heelers. Season 2. Episode 33. 1995-10-03. ^ "The Discount Suit". Blue Heelers. Season 2. Episode 39. 1995-11-07. ^ "Happy Families". Blue Heelers. Season 3. Episode 12. 1996-04-09. ^ "Moonlighting". Blue Heelers. Season 13. Episode 9. 2006-05-27. ^ "Lost". Blue Heelers. Season 12. Episode 41. 2005-11-26. ^ "Chasing Smoke". Blue Heelers. Season 12. Episode 5. 2005-03-02. ^ "Killing Time". Blue Heelers. Season 12. Episode 10. 2006-04-13. ^ a b c d Blue Heelers in town, Bendigo Advertiser, 8 April 2005. Retrieved 6 May 2008. ^ a b c Webster, Di. Blue Appealers, Who Weekly, 10 February 1997. Retrieved 3 May 2008. ^ a b Webb, Caroline; Idato, Michael. "Axe falls on Blue Heelers", The Age, 14 January 2006. Retrieved 26 March 2008. ^ a b Castlemaine, Australia, Australia eguide. Retrieved 3 May 2008. ^ a b Victorian Government. Famous television locations Archived 2 August 2008 at the Wayback Machine, Australian Centre for the Moving Image. Retrieved 3 May 2008. ^ a b c d e f g h i j k l m n o p q r "TOP-RATING AUSTRALIAN DRAMA SERIES AND SERIALS (INCLUDING COMEDY) ON TELEVISION, 1998–2003". screenaustralia.gov.au. Retrieved 15 July 2016. ^ a b c d e f g "TOP 20 DRAMA SERIES AND SERIALS SHOWN ON TELEVISION, 2004–2009". screenaustralia.gov.au. Retrieved 15 July 2016. ^ a b c d e Miller, Kylie. Investing in Blue Heelers' future, The Age, 7 July 2004. Retrieved 12 July 2008. ^ Warneke, Ross. The Publicity People Did It, The Age, 8 July 2008. Retrieved 12 June 2008. ^ Fidgeon, Robert. Blue if Heelers axed, The Herald Sun, 14 July 2004. Retrieved 12 June 2008. ^ a b c d e Casey, Marcus. The Force Is With Them, The Daily Telegraph, 25 August 2005. Retrieved 12 June 2008. ^ a b c Dennehy, Luke.Blue Heeler sees red, The Herald Sun, 29 April 2006. Retrieved 26 March 2008. ^ Fidegon, Robert. New Lease of Life for Blue Heelers, The Herald Sun, 7 August 2008. Retrieved 12 June 2008. ^ Enker, Debi. Blue Heelers review, The Age, 24 February 2005. Retrieved 13 June 2008. ^ Miller, Kylie.Heelers stay, The Age, 29 September 2005. Retrieved 26 March 2008. ^ Le Marquand, Sarah. Boot for Heelers, The Daily Telegraph, 14 January 2006. Retrieved 26 March 2008. ^ Nicholson, Sarah. Every Dog Had Its Day, 31 May 2006, The Courier-Mail. Retrieved 9 September 2008. ^ Blue Heelers Returns For Final Season, Seven Network, 13 March 2006. Retrieved 26 March 2008. ^ Witham, Katrina. Live and Laughing, The Courier-Mail, 15 April 2004. Retrieved 9 June 2008. ^ Miller, Kylie. Heelers Try New Trick, The Age, 15 April 2004. Retrieved 9 June 2008. ^ Blundell, Graeme. Cop Out, The Australian, 3 June 2006. Retrieved 26 March 2008. ^ Zuk, Tim. Blue Heelers season 8 (2001) episode guide, Australian Television Information Archive. Retrieved 11 July 2008. ^ "Blue Heelers Special". The Weakest Link. 2001-08-09. ^ AAP. Blue Heelers coming back, The Age, 30 September 2005. Retrieved 7 May 2008. ^ Zuk, Tim. List of Logie Award winners and nominees, Australian Television Information Archive. Retrieved 8 June 2008. ^ Television Awards 1986 – 2007 Archived 23 July 2008 at the Wayback Machine. Australian Film Institute. Retrieved 26 April 2008. ^ Australian Writers' Guild Awards. Australian Writers' Guild Awards of 1997. @ Australian Television Information Archive. Retrieved 26 April 2008. ^ Australian Writers' Guild Awards. Australian Writers' Guild Awards of 2002. @ Australian Television Information Archive. Retrieved 26 April 2008. ^ People's Choice Awards. People's Choice Awards of 1998. @ Australian Television Information Archive. Retrieved 26 April 2008. ^ People's Choice Awards. People's Choice Awards of 1999. @ Australian Television Information Archive. Retrieved 26 April 2008. ^ Tuohy, Wendy. True Blue and Loving It, The Age, 14 May 2000. Retrieved 16 June 2008. Heartbeat is a British police drama series set in 1960s North Riding of Yorkshire based on the "Constable" series of novels written by ex-policeman Peter N Walker, under the pseudonym Nicholas Rhea, and broadcast on ITV in 18 series between 1992 and 2010. It was made by ITV Studios at the Leeds Studios and on location. Heartbeat first aired on Friday 10 April 1992. The 372nd and final episode aired on Sunday 12 September 2010. The Chaser election specials are a number of Australian political satire based comedy programs produced by The Chaser. The shows, which have run under various titles, provide commentary on Australian federal election and has been produced since 2001 for ABC TV. The first show, The Election Chaser in 2001 was the first ever television production of the Chaser team. In 2004 and 2007 they produced The Chaser Decides which won the Logie Award for "Most Outstanding Comedy Program" for the 2004 series. In 2010, the Chaser team produced a 5-episode series about the 2010 election, called Yes We Canberra!. A new series was produced for the 2013 election, called The Hamster Decides. The Chaser’s Election Desk aired in the six weeks prior to the 2016 federal election. Comedy Inc. was an Australian sketch comedy television series, which ran on the Nine Network from 19 February 2003 to 26 December 2007. The series was produced by Crackerjack Productions. It first premiered in February 2003 in the new wave of Australian sketch comedy shows being launched across the free-to-air channels along with Big Bite and skitHOUSE. Since the end of the series episodes have been repeated on the Foxtel cable channel, The Comedy Channel and during 2009, reruns were shown on Nine HD before the channel's closure. Tasma Walton is an Australian television and film actress. Martin Colin Sacks is an Australian actor, chiefly known for his 12-year role on Blue Heelers from 1993–2005. The thirteenth and final season of the Australian police drama Blue Heelers premiered on the Seven Network on 1 April 2006 and aired on Saturday nights at 8:30 pm. The 11-episode season concluded 4 June 2006, due to its cancellation by the Seven Network as a result of its sharp decline in ratings. When, in late 2005, the time came to renew Blue Heelers, Seven commissioned eleven further episodes to be produced, but its future after this was still undecided. The first season of the Australian police-drama Blue Heelers premiered on the Seven Network on 10 September 1993 and aired on Tuesday nights at 7:30 PM. The 45-episode season concluded on 22 November 1994. The first season of the Australian drama series Sea Patrol premiered on the Nine Network on 5 July 2007. The 13-episode season concluded 4 October 2007. Set aboard HMAS Hammersley, an old Royal Australian Navy (RAN) patrol boat, the series follows the ship's company as they investigate the deaths of several people, who are linked by a web of intrigue.